On Clipper Cove is usually about kids’ smiles and volunteers’ hours. This one is different. Today’s message is for our kids, not about them: “Never give up and always support your team”. We watched 19 America’s Cup races on our iPad, from the spit in front of Marina Green or from The Bay. Our entire family was aboard Skipper’s Gift as we watched fateful race 8 from the windward mark when the Kiwis nearly tipped over. 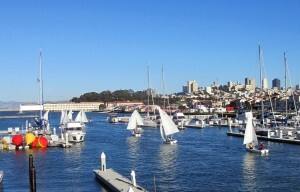 Yesterday we were fortunate to watch from the deck on Golden Gate Yacht Club. The media briefings following each day’s racing were as educational, insightful and motivational as the races were exciting. 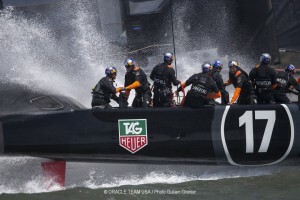 Jimmy Spithill and Dean Barker both remained poised under the relentless barrage of questions from the media. Jimmy was positive and “single-messaged” at all times. As the score started to heavily favor New Zealand and even when Oracle Team USA was down 1-8 his message remained the same: “Our design team, shore team and sailing team are all working together to make the boat faster and we will never give up”. 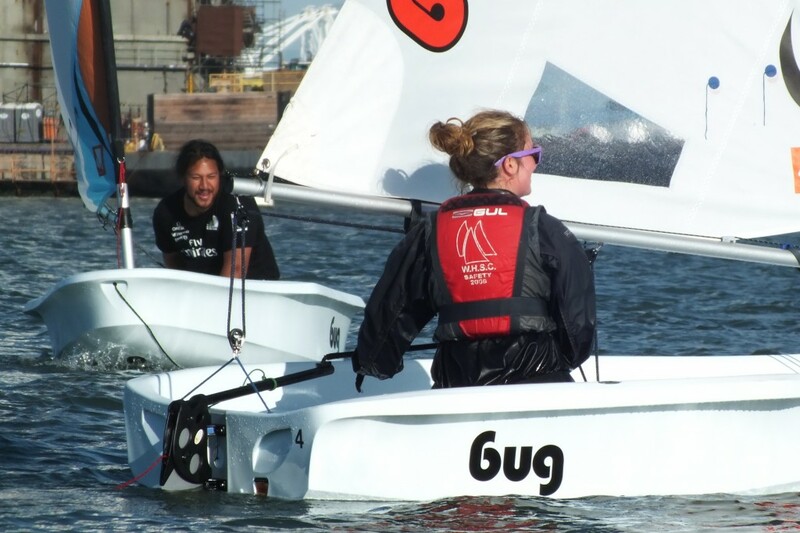 Building self-confidence can often be harder than teaching communications, goal setting and team work to young sailors. In fact, self confidence can only be gained, it can’t be taught. Dedicated instructors and coaches, adults who really care, and role models like ALL the AC teams make a big difference in motivate kids to work toward self-confidence. We have always taught our teams to play their best and have fun. At the end of the day, winning is always more fun than loosing. Here again, Jimmy’s final message was positive and encouraging. He acknowledged the boat performance and boat handling leadership New Zealand provided to everyone. When he said this was a tough fought match and unfortunate someone had to loose, it was clear he meant it. Same with everyone from OTUSA I saw interviewed. 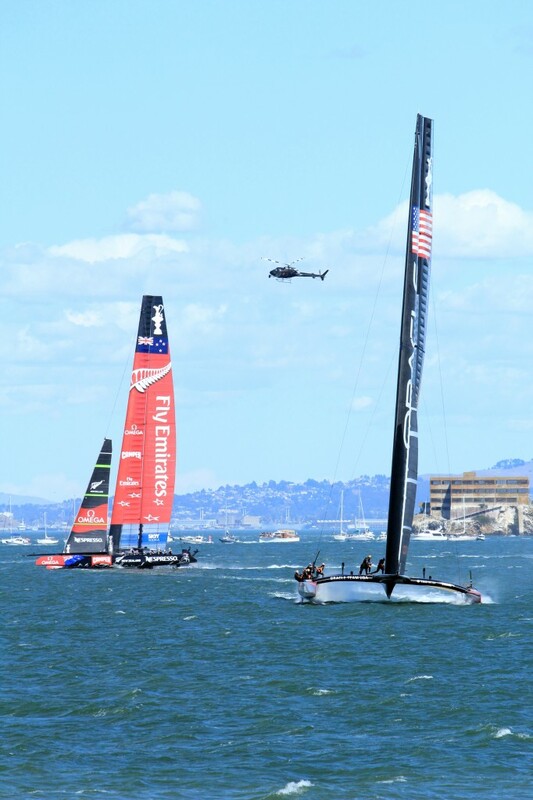 Were you able to fight back that small tear in your eye when the TV cameras showed the young kiwi on his father’s shoulders with the New Zealand flag in the background during the presentation of the Americas Cup ? I was not. 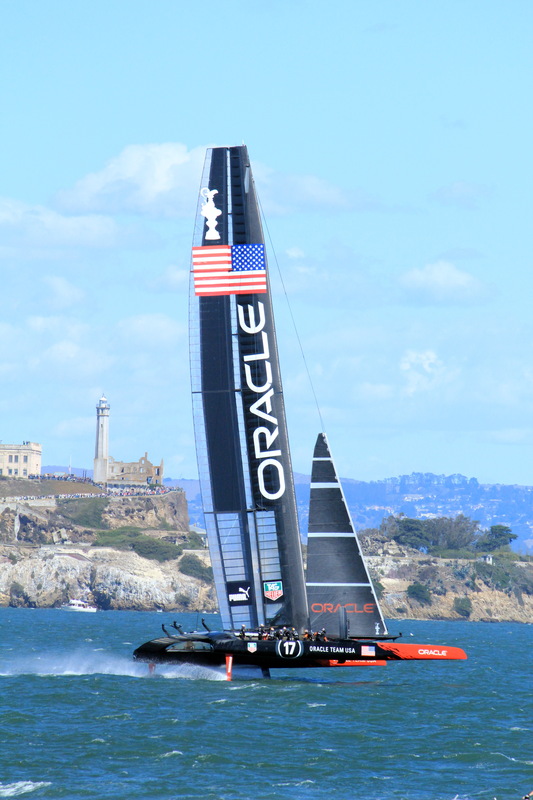 Sailing programs around the world will benefit from the excitement generated by the 34th America’s Cup. The 19 races over 19 days on these amazing foiling 72′ cats delivered a historical event which has changed how people view sailing forever. 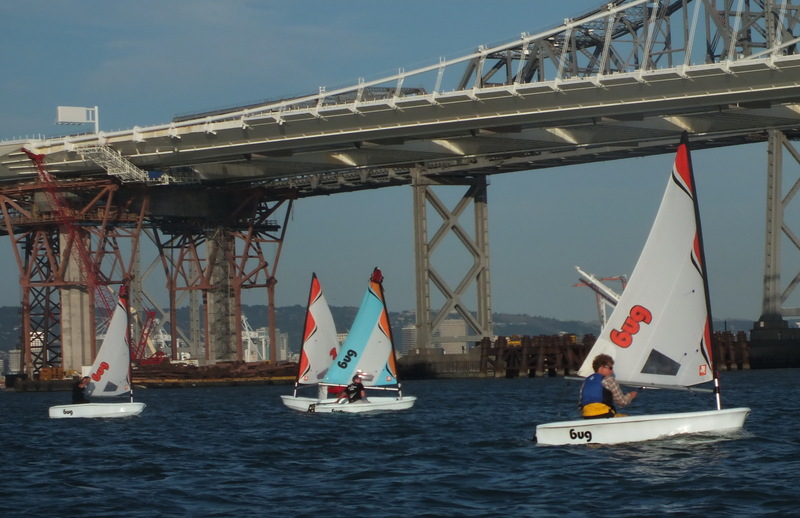 The material legacy from this event can already be seen around SF Bay with new docks and refurbished piers. 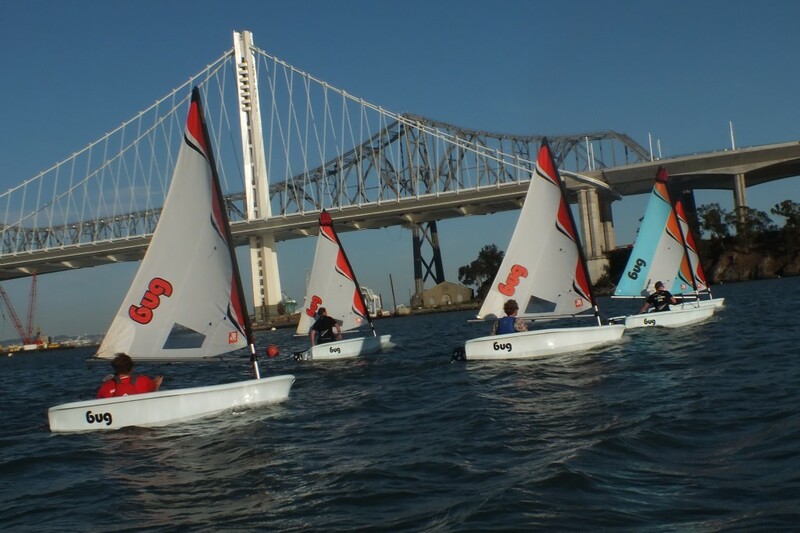 The Cup’s impact on fourth graders in the San Francisco Unified School District will start next week when students show up at TISC to attend the first “Set Sail Learn” classes we created in partnership with the San Francisco America’s Cup Organizing Committee and ONESF: Celebrate the Cup. Jimmy’s “imagine what an upset this would be if we won out from here” is at the very end (21:05) of the September 14th media briefing. The snippet where Jimmy talks about that possibility is here: Imagine . . . Links to the Redbull/Oracle “No Second Place” videos about the AC 72’s and SF bay. Jimmy talked about “the old girl” and the increase in upwind speed obtained over the last two weeks. It was this upwind performance that turned the tide in favor of AC17. 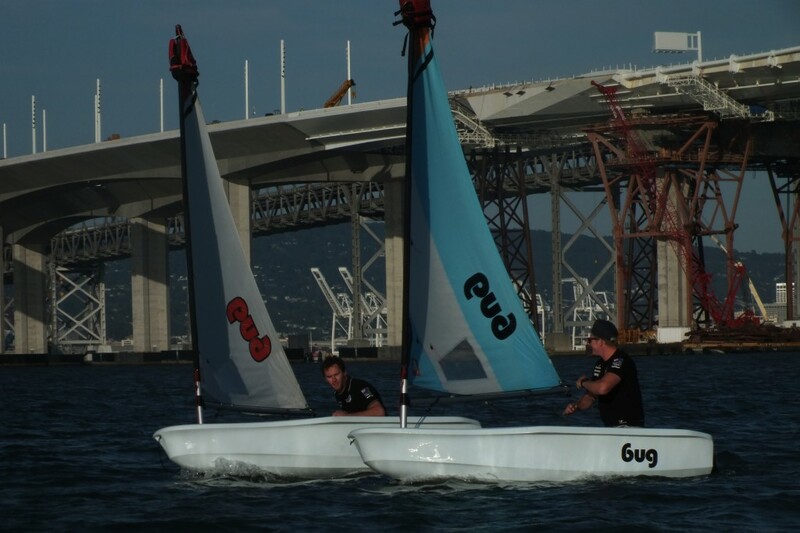 OTUSA AC17 and Aotearoa foil downwind during the last race. 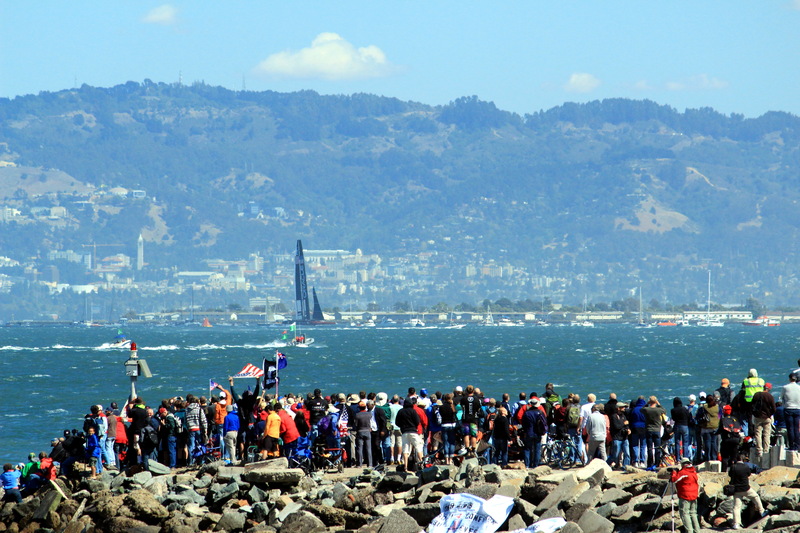 Crowds from all over the bay watch as Oracle Team USA head for the finish line after 19 hard-fought races. As the crowds dissipated junior sailors from St. Francis Yacht Club head out for practice on what just hours ago was the greatest racetrack in America’s Cup History. The Tetons were breathtakingly beautiful and Yellowstone NP showcased Mother Nature in live-action color for a recent family wedding in Wyoming. 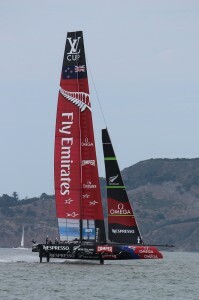 Saturday we watched Emirates Team New Zealand race Luna Rosa from Skipper’s Gift. Also colorful and action packed. The time seemed to fly by quickly between setting up chairs at 7:30 Saturday morning at Heart 6 Ranch and the first music from the string quartet at 10:30. I can’t say our hearts were racing but I will admit to working up a deadline-driven sweat before the wedding. 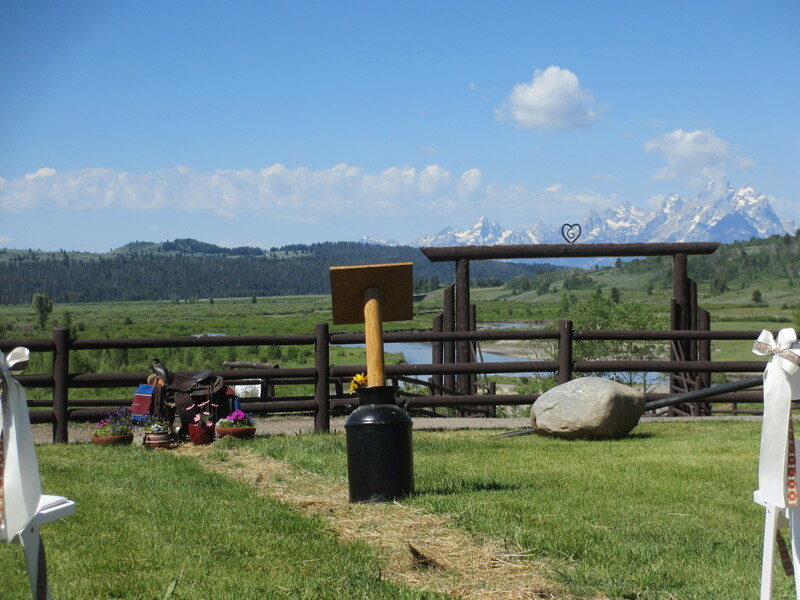 The Tetons delivered a view unlike any other wedding we’ve attended. 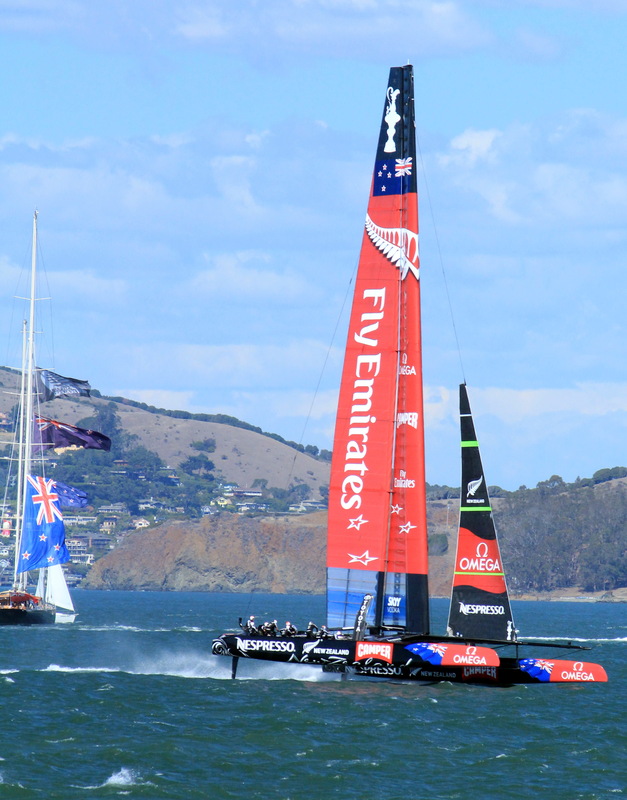 A week later we were watching the pre-start action between Aotearoa and Prada – the most strategically significant part of Saturday’s match race. 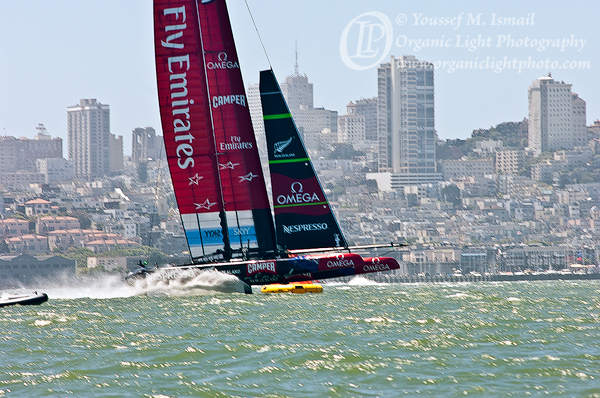 Seeing two foiling AC72’s was the most exciting part of the day. Maneuvers were a highlight. Synchronizing the efforts of all eleven crew has to be one of the most demanding aspects of racing these boats. 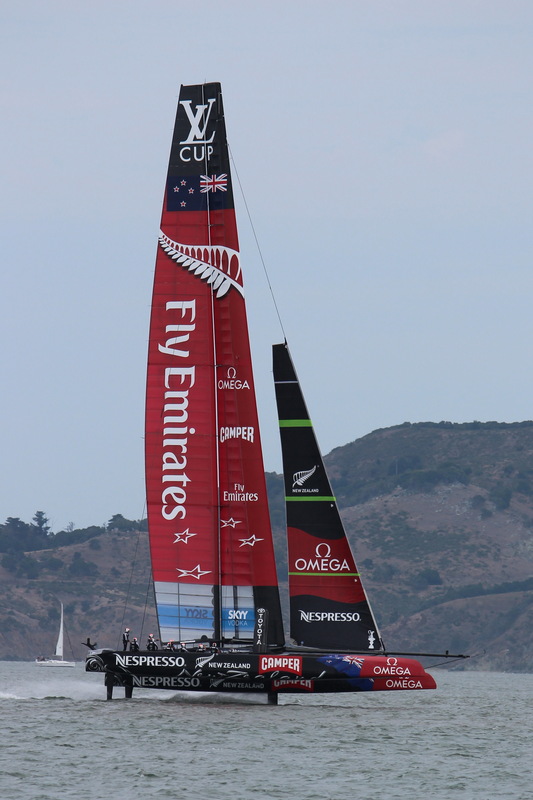 Watching the Emirates Team New Zealand boat round the leeward gate put a new perspective on dropping the chute on our J/24. Thanks to my friend Youssef Ismail for this shot taken as we passed south of Alcatraz. Back home I watched “Training to Win”, the second episode in the Red Bull series “Inside the Americas Cup: No Second Place” and was impressed by the focus on decision making under great stress and elevated heart rate. Especially the scene where crew members were stopped in the middle of their grinding and running exercises to solve mind puzzles. The America’s Cup presence here in the Bay provides exciting, even heart-throbbing, action whether you race sailboats, enjoy sailing, or have spent little time on the water. We’re fortunate to be able to watch live from the bay, on land, via TV and over the internet. 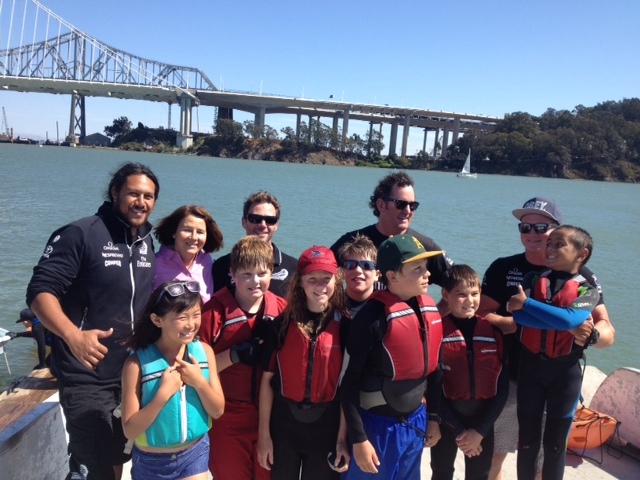 TISC doesn’t claim to train our kids for sailing in the Americas Cup (well, not yet anyway!). 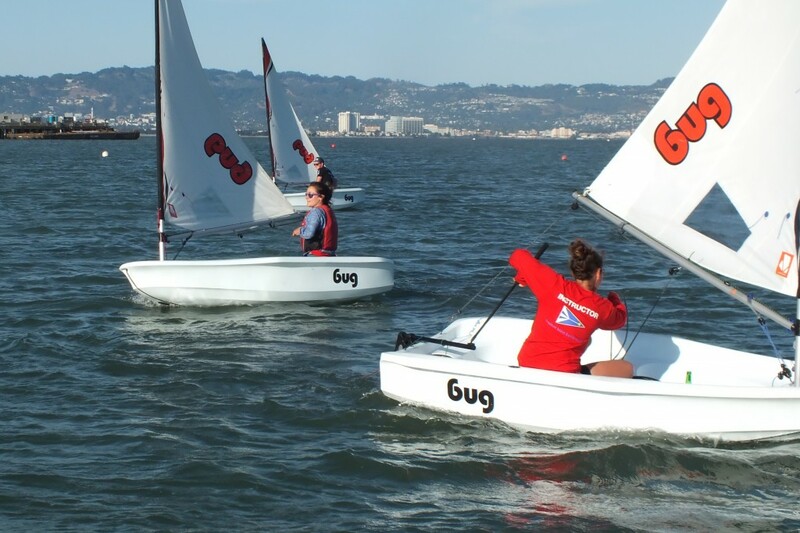 We do use sailing as a platform to teach goal setting, communications, teamwork and self-confidence to help them be successful now and later in life. We hope to peak kids’ interest in racing and we provide opportunities for racing individually and teamed with others. Manufacturing and repair technology has progressed rapidly over the last decade, even few years. We’ll be hosting a hands-on materials technology clinic here at TISC mid-August on a week night to be announced. 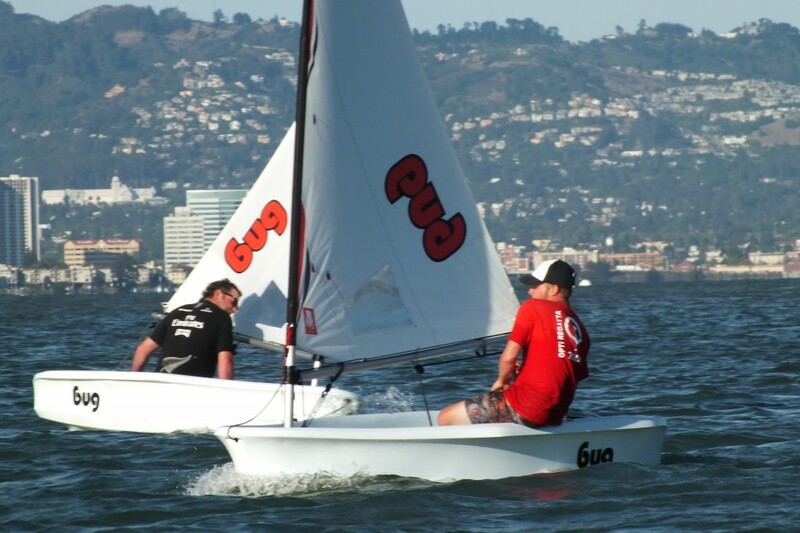 If you’re interested in learning more about the current state of technology of epoxy resin, gelcoat and carbon fiber materials used to manufacture and repair sailboats and sailing gear let me know via email (daveg@onclippercove.com). We will send additional details when available. Registration will be limited, with TISC tenants receiving first priority with advanced registration. A great opportunity to learn current best practices for working with epoxy-based materials.